Coachwhips are common to uncommon in arid regions below 2350 m (7700 ft) in California (Stebbins 1985). They are found in the deserts south of Mono Co. and the foothills of the coast ranges south of San Francisco Bay. There is an isolated population in the Sutter Buttes, Sutter Co. (Hayes and Cliff 1982). Coachwhips occur in open terrain and are most abundant in grass, desert, scrub, chaparral, and pasture habitats (Wilson 1970, Stebbins 1972). Feeding: Diet consists of rodents, lizards and eggs, snakes (including rattlesnakes), birds and eggs, young turtles, insects, and carrion (Cowles 1946, Stebbins 1954, Wright and Wright 1957, Carpenter 1958, Cunningham 1959, Miller and Stebbins 1964). Coachwhips search actively for prey, with their heads elevated. They poke their heads in burrows, or climb trees, using both vision and olfaction to detect prey (Stebbins 1954, 1985, Miller and Stebbins 1964), which is consumed alive and whole (Ortenburger 1928, Stebbins 1954, 1985). Cover: Coachwhips seek cover in rodent burrows, bushes, trees, and rock piles (Stebbins 1954, 1985, Miller and Stebbins 1964). They hibernate in soil or sand approximately 0.3 m (1 ft) below the surface, sometimes at the bases of plants (Wright and Wright 1957). Reproduction: Little is known about nest sites. One was recorded on the bank of a highway drainage ditch, approximately 0.3 m (1 ft) beneath the ground surface (Wright and Wright 1957). Water: In desert regions, coachwhips may be attracted to water to drink or ambush prey (Miller and Stebbins 1964). Pattern: Open habitats are preferred. Activity Patterns: Diurnal. Coachwhips are usually active mid-morning and late afternoon (Miller and Stebbins 1964) from March through October (Wright and Wright 1957). Reproduction: Mating occurs in April and May, eggs are laid June and July, and the first young appear in late August or early September (Stebbins 1954, Wright and Wright 1957, Fitch 1970). Clutch size ranges from 4 to 16 eggs with a mean of 8 to 10 (Stebbins 1954, Wright and Wright 1957, Carpenter 1958, Cunningham 1959, Fitch 1970). The incubation period in the lab is 76-79 days (Stebbins 1954). Niche: Coachwhips are mainly terrestrial, but occasionally climb trees and bushes to bask, seek prey and cover. These aggressive snakes will bite if captured. They are able to move rapidly, up to 12.8km (8 mi) per hour (Stebbins 1954, 1985, Miller and Stebbins 1964). Hawks are probable predators, and roadrunners may feed on young coachwhips. Brattstrom, B. H., and J. W. Warren. 1953. 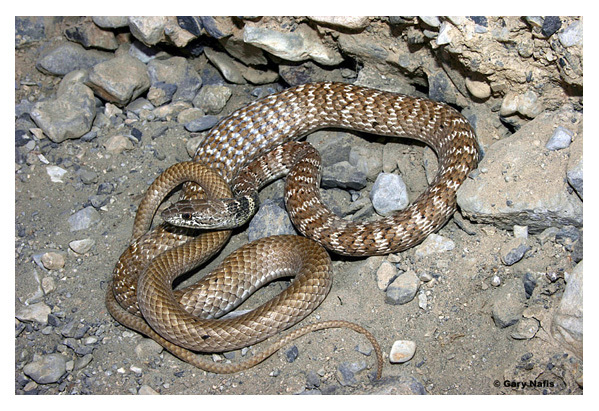 A new subspecies of racer, Masticophis flagellum, from the San Joaquin Valley of California. Herpetologica 9:177-179. Carpenter, C. C. 1958. Reproduction, young, eggs, and food of Oklahoma snakes. Herpetologica 14:113-115. Cowles, R. B. 1946. Carrion eating by a snake. Herpetologica 3:121-122. Hayes, M. and F. Cliff. 1982. 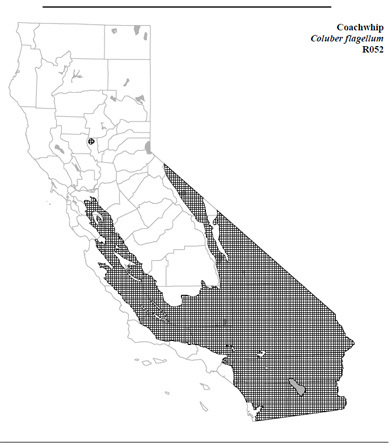 A checklist of the herpetofauna of Butte County, The Butte Sink and Sutter Buttes, California. Herp. Review 13:85-87. Ortenburger, A. I. 1928. The whipsnakes and racers: Genera Masticophis and Coluber. Mem. Univ. Mich. Mus. 1:1-247. Wilson, L. D. 1970. The coachwhip snake, Masticophis flagellum (Shaw): Taxonomy and distribution. Tulane Std. Zool. Bot. 16:31-99. Wilson, L. D. 1973. Masticophis flagellum. Cat. Am. Amphibians and Reptiles 145.1-145.4. Wright, A. H., and A. A. Wright. 1957. Handbook of frogs and toads of the United States and Canada. Cornell Univ. Press, New York. 640pp. Distinguishing characters: A species with highly variable dorsal coloration; tan, grey, red, or pink with bold black or brown crossbars or blotches on neck which may blend together; venter pink; slender body and tail; large eyes with round pupils; often described as a red snake with a black head. Juveniles: Black, brown or tan transverse bands on lighter background; black neck markings absent in hatchlings and faint in juveniles less than 24 in (61 cm) in length. 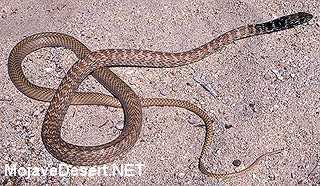 Similar species: Masticophis lateralis: Has distinct yellow lateral stripes. Additional notes: A fast moving diurnal snake that is difficult to capture. Bites, excretes musk and twists body when handled. Large individuals should be handled with caution.